Storm Beast is an Enemy in Demon's Souls. They are only found flying relatively high in the sky, and thus are immune to all melee attacks except, under special conditions, the Stormruler sword. They only attack by firing a large stinger barb at the player from their abdomens, which is well-telegraphed by a loud inhaling sound and a flux of air forming around the Storm Beast; this attack deals moderate physical damage. A player who is farming for Cloudstone must take care not to kill the creature while it is flying above an inaccessible area, as they are not difficult to kill and will fall to the ground exactly where they received the fatal blow. When it flies near a player, it will pull back and launch a large, gray spike. The spike has limited homing, so be wary that you'll still be hit if you move slowly. These attacks are preceded by a loud intake of air. 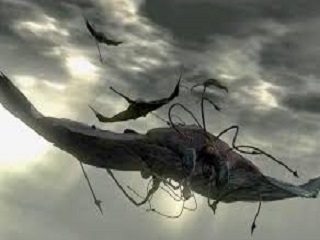 These guys fly around the background looking like nothing more than graphical set-pieces. But once they get close to you they emit a weird sound and toss a giant barb at you. This can be blocked with your shield without much trouble. To kill them, get within close lock-on range and use arrows or spells. They don't have much HP. When they die they usually drop a Cloudstone. Try to kill them over solid ground when you can to claim your prize. Also, if you equip a Thief's Ring, they won't bother you at all, except for rare circumstances (on the ridge in Shrine of Storms with the Gold Skeletons even with Thief's Ring on you can get bombarded by them so be wary). They get a little more alert in New Game+. Note for Old Hero Archstone: The Storm Beasts become berserkers of sorts here. Without a Thief's Ring equipped, they'll dash towards you in groups, firing volleys of barbs that will overwhelm your shield. Unless you are farming them with the Stormruler sword, you probably don't want them to bunch up like that. Advance very slowly and they will come at you one at a time. It is even possible to hit them with regular melee weapons in some circumstances.